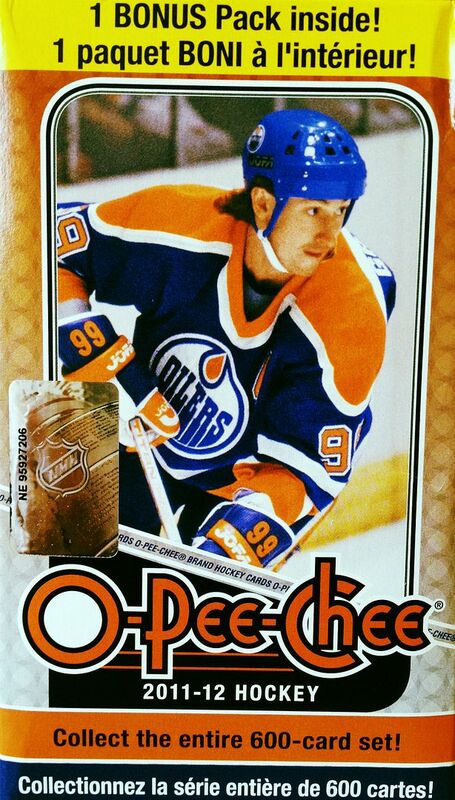 This week I'll be cracking open a box of 2011-12 O-Pee-Chee Hockey by Upper Deck. OPC is a great brand in my opinion. It captures the old school feel of card collecting, but still gives collectors opportunities to find hits - albeit only very rarely. I definitely am not expecting to get an autograph or memorabilia card out of this box, but that's not what this one is about. This one's about busting wax and seeing what you pull from this giant 600 card set. I don't bust OPC very often, but when I do, I always get the feeling that I should be buying more of it. See, I collected cards in the 80's and 90's, and this brand and the way it is structured has a very nostalgic feel for me. I love the design of the base cards. I love the actual cardboard stock aspect of them. It's just a great OG product. The modern collector in me is the one that backs away from this product. Getting any worthwhile hit from OPC is just way too hard. It's sad that that's what I'm looking for in cards, but it's true. I would rather go for an autograph set or get insane patches than put in the work of building a giant set of cards like that of OPC. I know that there are collectors that do put this set together... and that makes me happy to know. I feel that on some level sets like this are the closest thing to 'pure' there is in modern collecting. This box of O-Pee-Chee didn't yield anything of great value, but it was still a very fun break. It definitely helped not to expect anything. Instead of hoping for a hit, I was able to enjoy the cards coming out the of packs in a greater way. One of the things I enjoyed most about this break were the base cards. I really like the look of these cards. They are both retro and modern at the same time. It's this kind of design that made each year of cards in the old collecting days unique. When I first bought these cards in 2011 I was surprised to see the baby-blue borders and the circle pattern background. These are things that I view as creative and artistic in card design - something that just doesn't happen at the lower-end of card collecting now. Every pack that I broke had something in it as well, be it an insert card, parallel, rookie, or legend card. It was a nice little surprise to see which card in the pack was the 'special' card. In the end I got two 'leaders' multi-player cards, seven retro parallels, one rainbow foil, five rookies (including one from 10/11 OPC), three legends, and a couple more that show up in the top three. 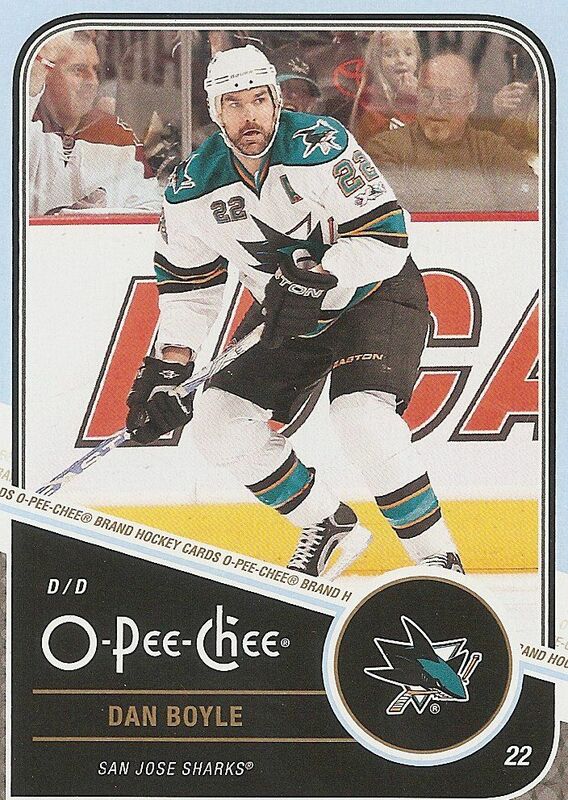 In my big pile of OPC cards from this break, Boyler was my only Shark! But I can't be too surprised as pulling things you want from the 600 behemoth is always a challenge. So I'm glad to find this talented d-man in my packs. One thing I really like about this card is its numbering. It is card number 22... the same as Boyle's jersey number! I think sometimes card companies honor players by giving their card number in the set the same as the jersey number that they wear. I wonder if this was the case for Mr. Boyle! This card looks almost the exact same as every other base card. 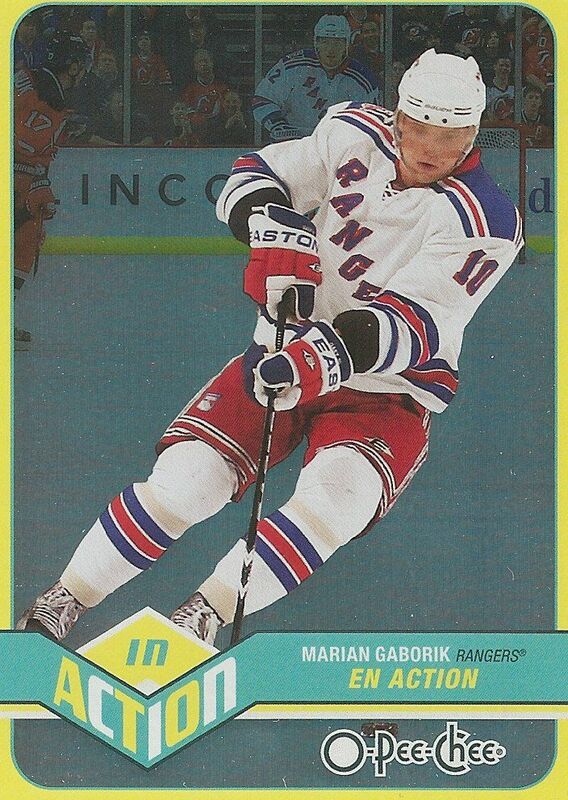 It's very difficult to tell in a scan, but the grey bottom border of this card is a little lighter. This signifies it as a parallel card. 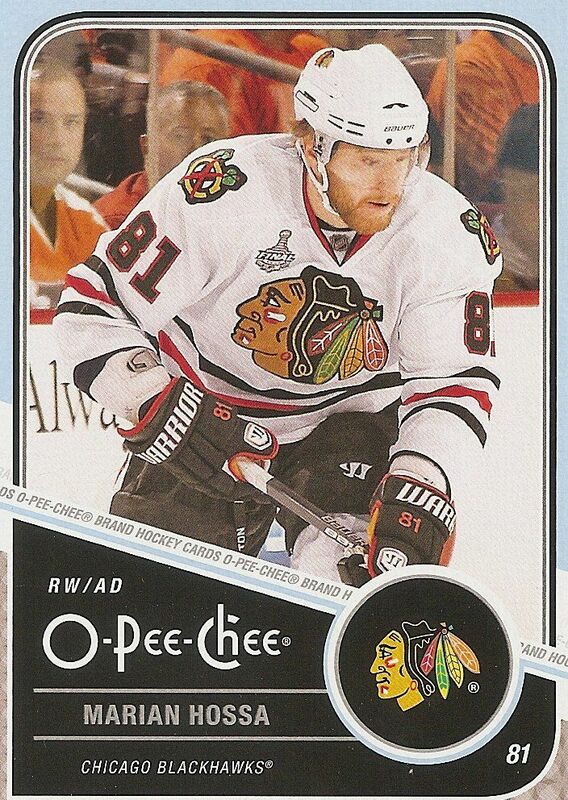 These parallels are very interesting because they all feature players sporting their playoff beards. What an awesome concept for a parallel set! It was one of the most unique ideas I had seen done on cardboard in a long while. Props to whoever came up with this! If you didn't know these existed in the 11/12 set you might have missed them. Go back and check for those lighter grey borders. Here comes the shine! The In Action insert cards in 11/12 OPC stand out not only in their shininess, but also in their girth. In Action cards are quite a bit thicker than the standard base or insert card. These cards look cool with a quasi-retro futuristic design, and feel cool with their premium card heft. These inserts don't hold a lot of value in today's market, but if they were to be found, say twenty years ago, I could see prices of these cards being quite high. At about ten dollars, this box came out a little pricier than last week's break of Pinnacle - with no hit! But like I stated in the beginning of this review, OPC is not about the hits. This product is great for collectors on a budget who want a challenging set to collect. The set collecting part of the hobby has definitely diminished with the introduction of high powered rare autographs and material cards, but OPC has stayed strong through the years... there are those who appreciate what it brings to the table. I certainly do. OPC is not an expensive break. For the collector looking for some old school card collecting fun, this would be a great set to buy. Let me know what you thought of my 11/12 O-Pee-Chee blaster down in the comments below. What have you gotten out of these blasters? I'd love to know! Since your starting to get Sacramento kings cards now do you think that you could do a basketball blaster box for retail review?